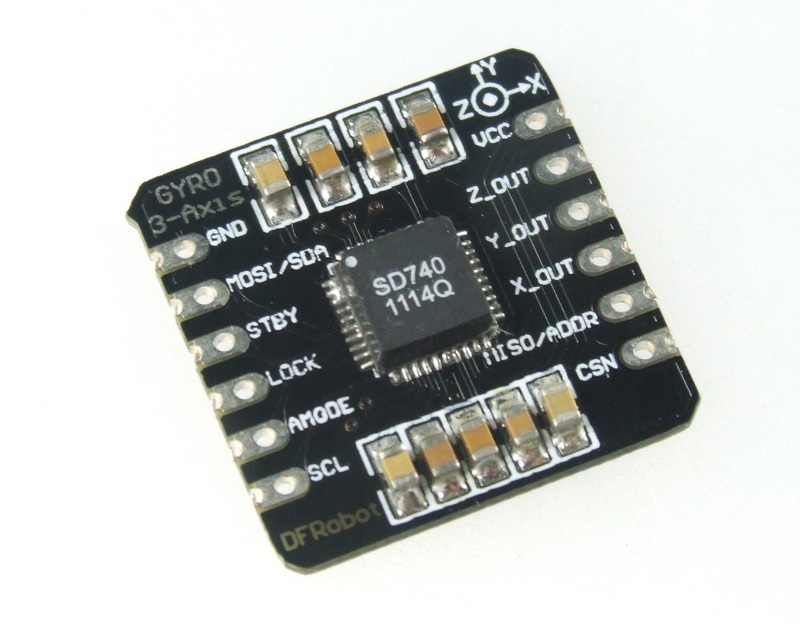 This is a breakout board for the tri-axis SD740 gyroscope. The SD740 inertial module integrates a tri-axial micro machined gyroscope together with a signal conditioning ASIC in 0.18um CMOS technology. The ASIC provides configurable output filters allowing the user to customize both gain and bandwidth. Zero rate bias can be adjusted as well. The sensor elements are forced to a primary vibration. The gyro features a primary output with a +/-1024 degrees/s full scale range (digitally scalable down to +/-64 degrees/s). Gyroscope signal conditioning is fully performed in the digital domain ensuring superior signal stability and performance. The signal processing operates at high data rates resulting in a high output value refresh rate of less than 100us. The module is designed to operate with 3 interfaces: 1. Digital SPI 2. Digital I2C 3. Analog Outputs Configuration pads allow the user to select the proper interface. Warning: Please only use 3.3v to supply power to the Gyroscope. <100uA standby current; power off mode available. 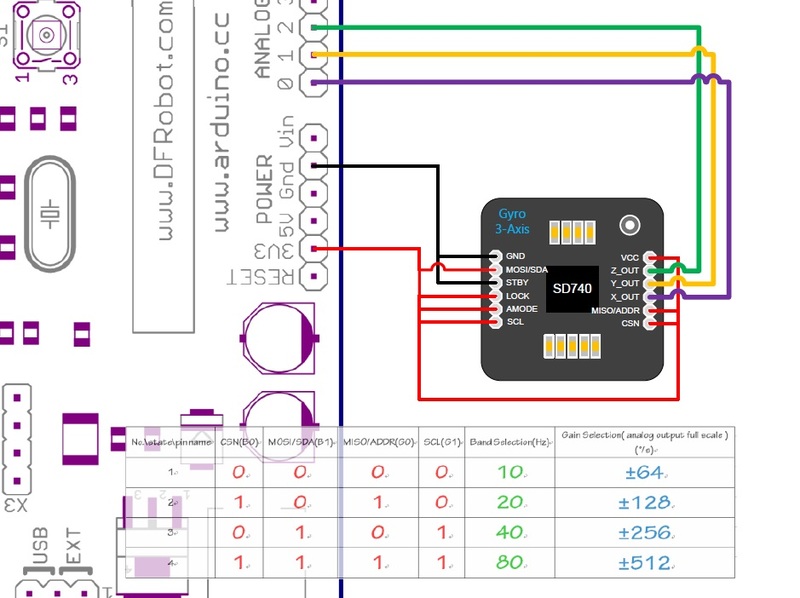 RAR file with all sample codes, data sheets, and wiring diagrams. 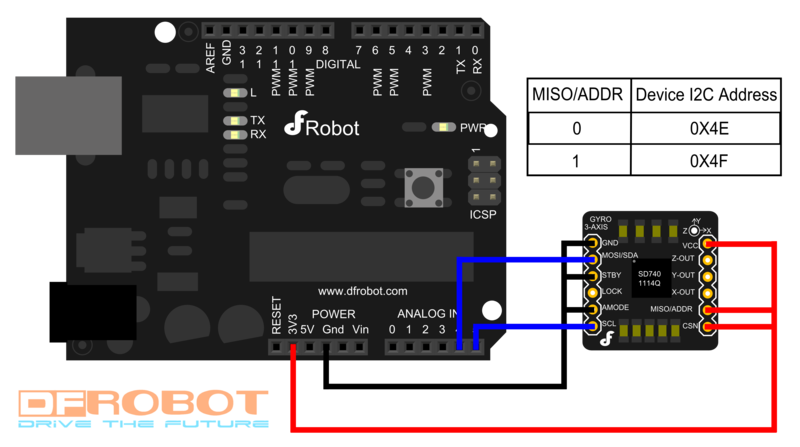 Get (SKU:SEN0095) from DFRobot Store or DFRobot Distributor.